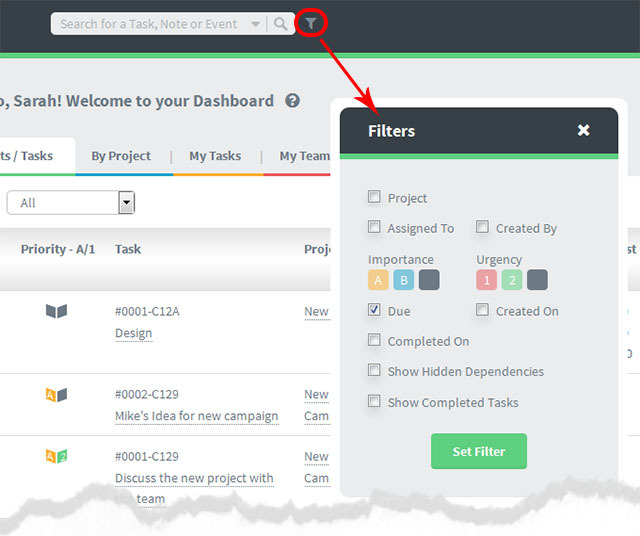 Filters are available in various screens eg your dashboard., project overviews and search area. To open filters simply click on the “filters” button. Mouse over the “Filter” selections and a drop down will appear. If you click on the “Due” value, only Due tasks will show on the screen. These filter settings allow you to narrow down on what you see on the screen by several factors. Combining the various settings can be very powerful. 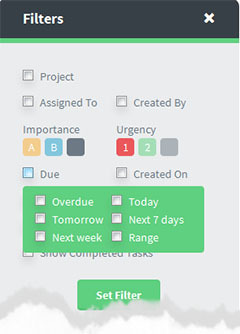 For example: Combining tasks “assigned to” with the “Priority” and the “Due” date ranges would allow you to see every task assigned to person X with top priority’s due between specific dates. You could use this, for example, if your Team Member (see here) John has asked to take holidays and you need to reallocate his tasks for this period to other staff. Use the Multiple Action Selection Tool (more info) in combination with your filters for extra power ! Filtering by Task Statuses can’t be done on the Dashboard (ie combined projects overview screens) because they are project specific. For the same reason you can’t filter by Task List. However you can filter for both these within a project eg go to “Project Overview” or “Project Task Lists” and use the filters.